Coconut Red Lentil Peanut Soup is a hearty West African soup is easy to make, healthy and incredibly delicious. It makes the perfect Meatless Monday dinner recipe that is naturally both vegan and gluten-free. You will LOVE it! This is it, guys. This coconut red lentil peanut soup shot through all previous competitors and planted itself firmly in the #1 spot as my absolute favorite soup recipe. I may never make another soup again. It's creamy, dreamy, soup perfection. Make this, make this, make this. That is all. I'm going now. I'm joking, I'm not done trying to convince you to pull out your biggest pot and whip up a bowl of heaven. If you think that peanut soup sounds a little strange don't worry, you're not alone. My handsome man's eyebrows got all scrunched up funny when I told him I was making peanut soup for dinner. And I have to hand it to him, peanuts + tomatoes + kale + lentils does sound like an odd combo. It certainly doesn't seem like it would melt itself together into the most delicious soup ever. Funny how that works, isn't it? You know, like this whole cooking thing. How you take a bunch of random ingredients and together they become something super awesome. It's like magic. Red lentil peanut soup is a hearty West African soup made from a base of tomatoes, lentils and ground peanuts – or all-natural peanut butter if you're lazy, like me. I use coconut milk along with the broth because I love the extra rich flavor it gives the soup. You'll often find peanut soup recipes that are made with chicken and chicken broth, but I love this vegetarian (and vegan!) peanut soup better than any other. It's such a hearty soup that you really don't need to add any meat to it. It's the perfect Meatless Monday meal. Extra bonus … this peanut soup reheats beautifully. If you're feeding more than four people, I'd recommend doubling the recipe. You'll want leftovers. 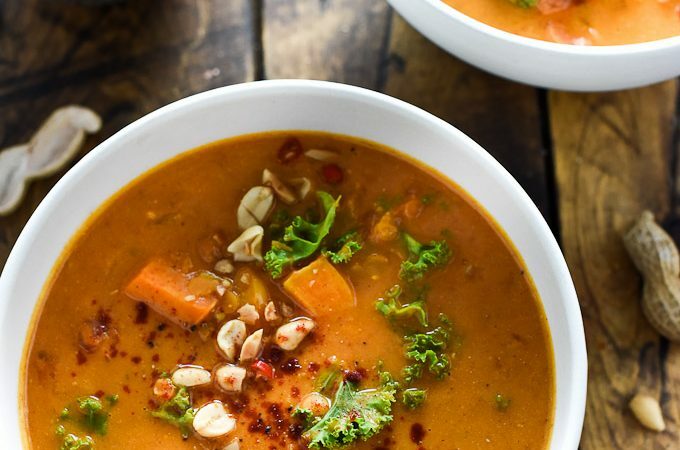 If you make this Coconut Red Lentil Peanut Soup make sure to snap a pic and tag @theendlessmeal on Instagram so I can like and comment on your photos. I love seeing TEM recipes you create! Coconut Red Lentil Peanut Soup is a hearty West African soup is easy to make, healthy and incredibly delicious. It makes the perfect Meatless Monday dinner. Heat the oil in a medium-sized pot over medium-high heat. Add the onion and cook, stirring occasionally, until it is quite brown, about 10 minutes. Add the bell peppers, carrots, ginger and garlic and cook until the vegetables are soft. Stir in the red chilies, cinnamon, smoked paprika, cumin and turmeric and let the spices cook for 1 minute. Add the yams, diced tomatoes and the stock or water and bring the pot to a boil. Reduce the heat to low and let the pot simmer, uncovered, for 30 minutes, or until the vegetables are soft. Stir in the red lentil and peanut butter and let the soup cook until the lentils are soft, about 10 minutes. Blend half the soup using a blender or hand-held immersion blender. If using a blender, add the blended soup back to the pot. Stir in the coconut milk and kale and let the kale wilt. Season to taste with sea salt. This looks divine!!! Do you think it would still be okay without the tomatoes? I’m not sure of any other substitute for them and I try not to eat them too often, they don’t agree with me. Roasted the sweet potatoes in oil with some salt and added them with the lentils and it made a world of difference. I find boiling sweet potatoes in soups make the soup too sweet and starchy flavored. It also made a great presentation with some roasted sweet potato on top. I would love to add pulled chicken thighs next time and make this more of a stew. I made this for my family and everyone loved it! Including my toddler. I took the leftovers for lunch and everyone asked for the recipe…just based on the smell. It is so yummy I can’t wait to make it again. Thank you for a great recipe and for inspiration with different flavor combinations! So great when the kids gobble up dinner!! Made this with sunflower seed butter because my 10 month old is allergic to peanuts, and we all loved it! Lentil-averse husband couldn’t stop eating it straight from the pot. SO GOOD and thanks for all your amazing recipes! I’m a new fan. So happy to hear we have a new lentil convert! Hooray!! O my gosh! This is soooo delicious! Thank you for sharing! You are so welcome! I’m so happy you liked it! Thank you!! Yummmm!!! Will be making this delicious recipe OFTEN !! Kristen, just made this absolutely scrumptious soup! Wow! This will be integrated into my regular rotation of meals. I made it in my Instant Pot and turned out beautifully! I doubled it cuz I like to freeze half for a later date-so glad I made a huge pot! I used half the coconut milk and added another handful of chopped baby kale. Thank you! Just about to sit down and eat this lovely soup,smells amazing tastes the same. Thanks for a great recipe. It makes me so happy that your little one love this recipe! She’s got good taste!! 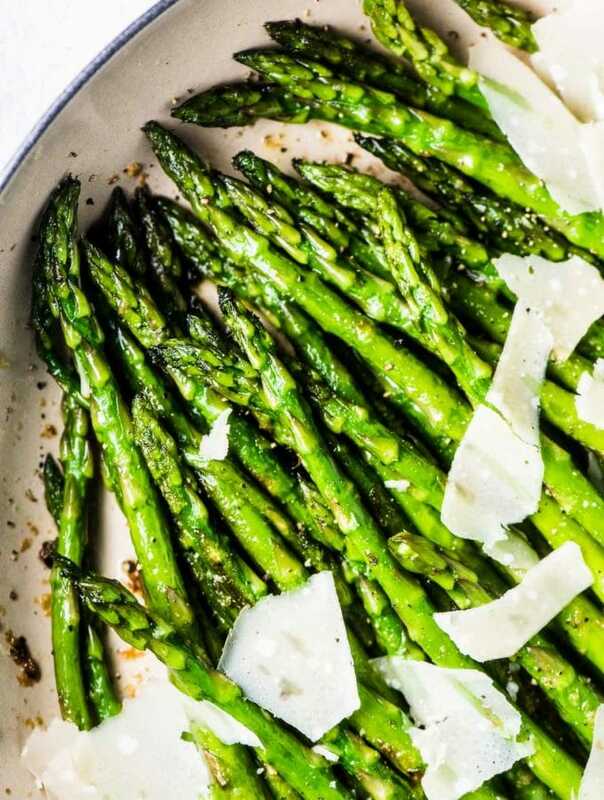 I just made this recipe for supper tonight, AMAZING. This is definitely a keeper! The flavours are rich and decadent, in a good way! I don’t normally like kale, but with this soup, I surprised myself enjoying its texture and flavour. 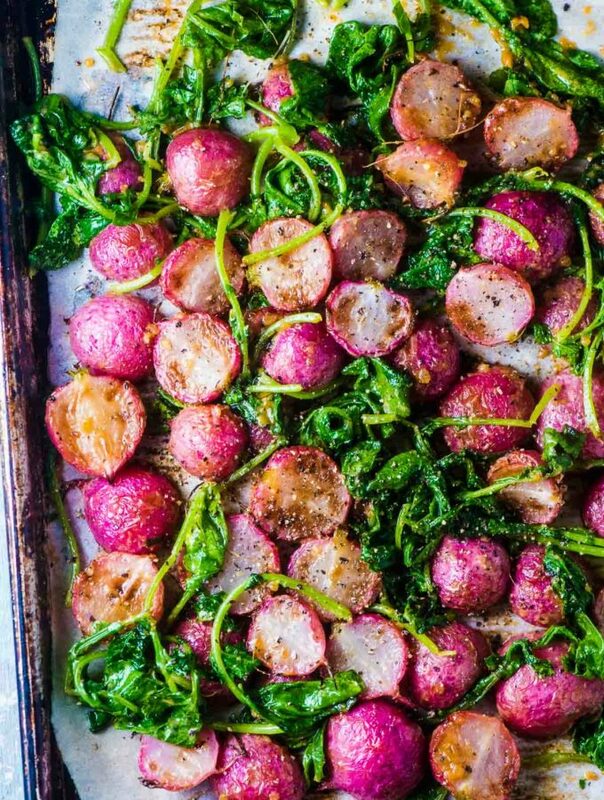 Thank you so much for posting this recipe which would impress anyone who is reluctant to admit that a vegan dish can be better than any non-vegan recipe. Every time I come to your site, I linger on this soup. It’s a real beaut! Thank you so much, Robyn! I hope you and your family have a wonderful Christmas, too!! What is not to love about this combo of spicy and rich and creamy. I cant wait to try this but want to know what kind of bell peppers you used. Were they green bell peppers? I used a red pepper for the batch in the photos, but any kind of bell pepper will work. I tend to use them interchangeably since they’re so similar. Enjoy! The photos are superb and this recipe is definitely on my list. Love lentil soups, have read about this before, but you’ve inspired me! Of all the lentil soups I’ve tried, this is my fav. Definitely a keeper! 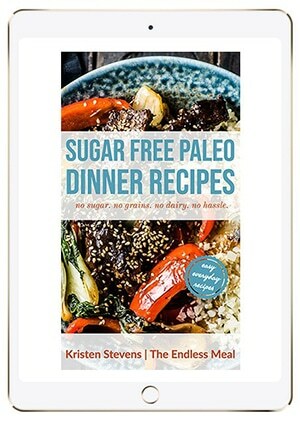 Looks amazing, Kristen <3 And I love adding peanut butter to my tomato or coconut based soups — adds such an interesting creaminess and flavor. Love it. Oh my goodness, Kristen, I agree – this could be the best soup ever! I love the flavours in West African dishes, and so many other regions of Africa. They have a way of combining ingredients that seem to be light years ahead of us. I’ve got some peanut butter – loving nephews who are going to be so happy when I put this on the table. Great recipe – thank you! You’re so right about African flavours. I just love how spicy and rich they are. So happy you like the recipe! I adore African Peanut soup, so many great flavours and textures! I’m with you on the spicy! Everything is better when it’s spicy, isn’t it?! I most definitely agree! I am currently living in Indonesia and I adore putting freshly made sambal sauce on everything! Spicy is always better, isn’t it? I haven’t been to Indonesia yet but it’s on my list! Hi there – looks delicious. How much coconut milk did you add? Fantastic – thank you. I plan on making this in the next few days! I lived in West Africa and ate a lot of their peanut (groundnut) soup – usually with chicken or guinea fowl, but this veg version looks awesome! I’d love to hear how it compares to the real thing. West Africa is on my list places to visit one day!